Miranda and I walked further down our new slack-beach-spot and found even better possibilities. We also found a pretty much abandoned beach. I am not sure if this is because it’s Saturday, or what, but the beach was essentially empty. 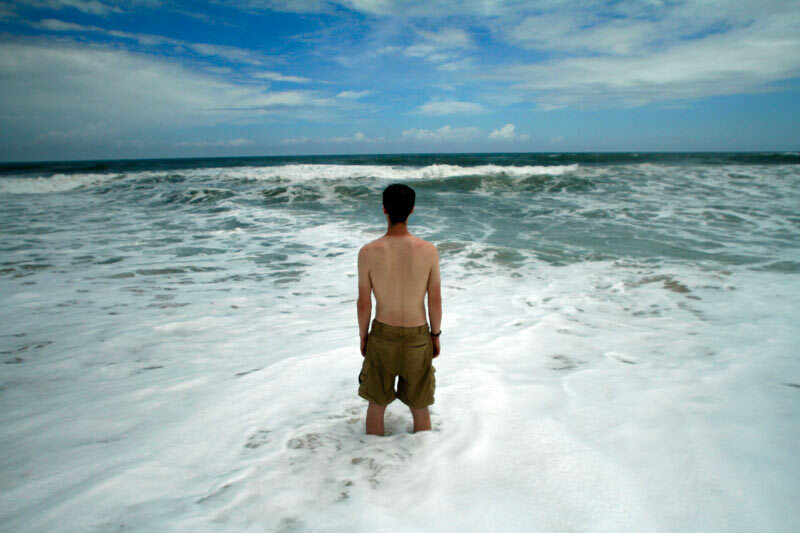 For the first time we could really let loose — I was able to take off my shirt and put on shorts and actually go into the water. I’ll let the tan lines in this pic Miranda surreptitiously snapped tell the story of what parts of my body Ghanaian culture requires remain covered. We found a nice 30ft stretch of palm trees (although right on the edge of a nasty dune-cliff) and strung up a line. I am definitely rusty, not having slacked in almost 2 months, but my skills started coming back quickly. Part of why I took 2 months off, besides being busy, is that I had a really bad bout of vertigo, possibly as a reaction to my Yellow Fever vaccine, and I still have yet to fully get over that. I have to see an ENT specialist when I get back to the states, to figure out exactly what is wrong. We’d been planning to spend the day in Kakum National Forest. They have the world’s longest tree canopy walk, and we’d both wanted to see it. Unfortunately we were awakened in the middle of the night, first by our friend Dom at 1am saying he’d just had his phones stolen, and then a few hours later by a torrent of rain on the steel corrugated roofs outside out room window. When it rains in Ghana, it RAINS. By morning time it was looking dryer and Miranda still wanted to hit the forest. It’s only an hour or so trotro ride to Kakum, so we started walking to get redred for breakfast, buy some water, and then catch a trotro when it started to rain. At first it was nice, since it’s mid 80s (F) here, it basically felt like a light shower. But after a few minutes the rain intensitifed and we were soon seeking shelter under an awning along with every other person around. We spent 20 or so minutes under the awning, happy that my backpack is water proofed, before deciding to walk the remaining few hundred meters to our redred seller, where we were pretty sure there was an awning. Further encouraging this decision was the toothless old woman behind me who kept mutter “adom, adom” at me. Adom apparently means “grace,” but it also sounds exactly like my name, so hearing people mutter it is a bit uncanny. By the time we finished with redred and started walking someone called out “adom adom” again and I did my best to ignore them until I realized it was Dom and he was actually calling for me, not for grace. I feel like I am running out of new insights to inject into this blog. The first few days here we learned so much, and maybe now I feel like we are finally catching up to where we need to be. We’ve been here a week (4 days in Cape) and finally know our way around — we can find the food we are looking for, buy water, walk on one-lane roads being used in both directions without getting run over by taxis, and know pretty much when to ignore people who call out to us. Of all the things that have yet to get old, I think the sensory aspect of Africa is still the most vibrant for me. We are sitting in our guestroom and I can hear a marching band (well, it sounds like a Mariachi band, but it’s obviously not Mariachi) somewhere outside our window playing over drums. Closer there are two men talking animatedly in Twi or Fanti. I hear birds chirping and the occasional bleat of a goat. When I walk the streets, or even look out the window, I see hundred-year-old buildings made with local concrete and sourced materials and painted in vibrant colors. This vibrance is contrasted against a certain ubiquitous level of dilapidation and patina that coats virtually everything. The more time I spend here the more it feels to me like the islands, like Haiti or Jamaica. I have yet to really figure out why this is, but I am surely excited to try and capture it on film (in motion) in the near future. Dom has been working on renting us a room in a house he knows of; we are just waiting for the man who owns it to return from Togo (or somewhere nearby, I forget exactly) to say yes for sure. Once we have a “home base” then our stuff will be more secure and we can set about filming rather than just exploring with an 80lb pack on my back. Miranda just did the math on our day’s spending — I’ll let her post it to her blog (that’s right, look under the “blogs” tab now and you’ll see that Miranda also has a blog! ), but basically I am astounded at how cheaply we can eat/live here, even though I knew this ahead of time. I read a blog from a girl, before we came here, where she had a pricey dinner and recounted feeling bad and then realized that her dinner had been $4USD equivalent. Well, I ate lunch at Oasis today, for about $2.80USD. This reinforces for me how much change can be effectuated for so cheaply, the single foot on the rung of development and all of the things Sachs talks about. And it reenforces why a twenty-six cent vaccine can be out of the reach of so many — I’m busy marveling at filling myself at a restaurant for under three bucks, when the average Ghanaian will earn less than that in a day. I’ve dealt with some personal ambivalence when it comes to this trip, to availing myself of things that the people we seek to serve do not have. Taking malarial prophylaxis, getting a Yellow Fever vaccine, etc. Some I had no choice about — I couldn’t have come to Ghana without the YF vaccination, it’s required by law for a visa here. But others I do have a choice about, and it comes down to a choice between trying to live as closely to those I am seeking to serve, and advantaging myself so I can give them better service. If I am sick from malaria, the film probably will suffer, so to risk all of that over pennies a day for a doxycyclene pill does seem short-sighted. But where to draw this line becomes difficult. For me, I am trying to live as simply as possible when in Africa. So $8/person per day is a pretty good start, but it’s still 400% of what the average Ghanaian lives on. Then again, the average Ghanaian isn’t carrying an 80lb waterproof pack full of thousands of dollars of film gear, so the question remains where do we draw the line? I’m not sure, but I think it ought to be below $8. This entry was posted on Saturday, September 18th, 2010 at 5:57 pm. 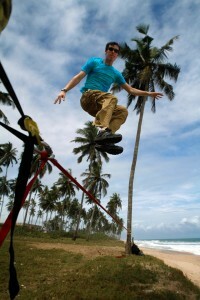 It is filed under Blog - Adam and tagged with Cape Coast, Ghana, Slackline. You can follow any responses to this entry through the RSS 2.0 feed.